The Rogers Island Visitors Center at Fort Edward is hosting the Rogers Rangers Challenge triathlon. The run, canoe/kayak, and bike event will be held (rain or shine) on Saturday October 3, 2009. 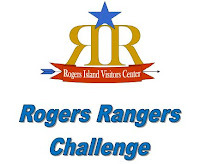 The Rogers Rangers Challenge is dedicated to the memory of Major Robert Rogers and his Independent Company of American Rangers which were based on Rogers Island at Fort Edward during the French & Indian War (1755-1763). Rogers Rangers, forerunners of the U.S. Army Rangers, fought and died on ground upon which the challenge takes place. Local Native Americans described Rogers as having the ability to “run like a deer.” Participants in the event are encouraged to dress in period costume. 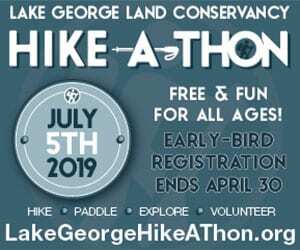 The Challenge begins at the Hogtown Trailhead with a run over Buck Mountain to Fort Ann Beach at Pilot Knob (7.5 miles) and then a canoe/ kayak along the east shore of Lake George (3 miles) (a Compass is recommended due to the potential of thick fog). The final leg is a bike from Fort Ann Beach to Rogers Island Visitors Center, Fort Edward (30 miles). The race is limited to 100 participants and you must be at least 16 to participate. The entry fees is $60.00 per person which includes membership to Rogers Island Visitors Center, and entertainment & catered lunch for each participant. Participants must pre-register by September 12th; for more information e-mail Eileen Hannay at rogersisland@gmail.com or call 518-747-3693. Over the weekend of August 8th and 9th three of the more experienced 4-H Adirondack Youth Guides participated in a special trip offered only to active 4-H Guides who have reached Intermediate level or above. This year’s trip included a 14-mile paddle in canoes from Lower Saranac Lake to Middle Saranac Lake and a hike up Ampersand Mountain. The three youth guides spent several weeks preparing for the trip. They met for three weeks to plan the menu, itinerary, and logistics. They secured the camping permit and then acted as the guides for three adults during the entire journey. The trip began at the Route 3 DEC Ranger Station on Lower Saranac Lake where participants paddled to Bluff Island for lunch and then through the Saranac River to a campsite on the Northwestern edge of Middle Saranac Lake. The Youth Guides planned and facilitated educational programs on aquatic life, wild bird identification and astronomy and used GPS units in a team building exercise. 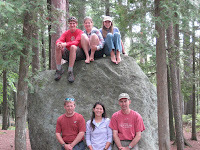 On the second day the group paddled back to Lower Saranac and then climbed Ampersand Mountain. The 4-H Youth Guide Program is offered to any young person age 12 and over with an interest in acquiring outdoor skills and experience. 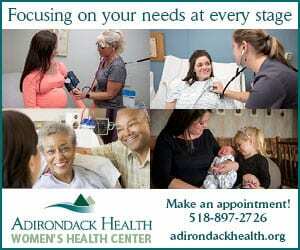 For more information contact John Bowe or Martina Yngente at Cornell Cooperative Extension at (518) 668-4881. Photo: 2009 ADK Youth Guide trip participants; Top – Ben Hoffman, Sabrina Fish and Michaela Dunn; Bottom – John Bowe 4-H Team Leader, Martina Yngente 4-H Community Educator and Tabor Dunn- chaperone. 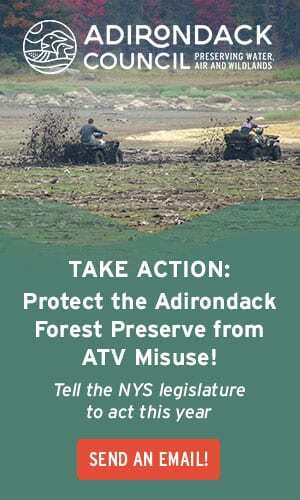 Protect the Adirondacks! 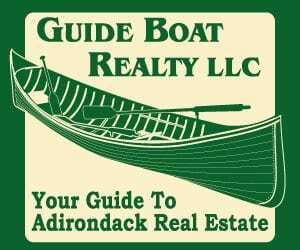 will host the 7th Clean Waters Benefit on Saturday, August 22, 2009 at Hornbeck Boatworks off Troutbrook Road in Olmstedville, in the Town of Minerva to raise funds for its programs and services in the Adirondack Park. The event will begin at 11:30 AM with a canoe/kayak paddle on Minerva Stream, concluding at the historic Olmstedville dam. Participants are asked to bring their own canoe and be prepared to pull over several beaver dams. Tours of Hornbeck Boat Works and of the owner’s Forest Stewardship Council certified forest will begin at 12:30 PM. A Reception begins at 3:00 PM and features author Bill McKibben as the event’s guest speaker along with Adirondack singer-songwriter Dan Berggren. » Continue Reading. The 4th Annual Whiteface 5K Downhill Mountain Bike Race, part of the 2009 Gravity East Series, will take place on August 29-30 at the Whiteface Mountain Bike Park. The race, which also doubles as the Pro GRT Final, will be the first Gravity East event to feature a pro qualifying and seeding run. The pro men’s race will include a $2,000 purse for the winner. The weekend will also feature a round of Gravity East’s inaugural e.thirteen Dual Slalom Series and a chainless downhill after the main event for fun. The Whiteface 5K is almost three miles long, and an eight-plus minute downhill course that is the longest mountain bike competition in the East, with 2,456-vertical feet from the top of Little Whiteface. The main event is sponsored by High Peaks Cyclery who will offer a $5,000 overall purse. Last year’s winner Geritt Beytagh finished with a time of 7 minutes, 24.47 seconds and only seven competitors finished the race under eight minutes. The race course will be marked five days prior to the event, and is available for training seven days a week including race day. There will be one course for all categories. Participants can register online at www.active.com until August 27 at 12 p.m. for just $25. Riders may also pre-register by phone at 877-228-4881 (option #2 then #3), event 177-1411. Racers can register at Whiteface from August 28 until 11 a.m. on August 29 for $35. The competition will be professionally timed by All Sports Events. Interested participants can check out bike and stay packages, beginning at $59 per person including lift ticket and hot breakfast, at www.downhillmike.com. The website also offers specific race info, and video and photos from last year. The Whiteface Downhill Mountain Bike Park is open daily from 10 a.m. – 4 p.m. Free guided tours are available weekends at 1 p.m. and 3:45 p.m. Lift tickets, mountain bike rentals, lessons, clinics and more are available right on site. 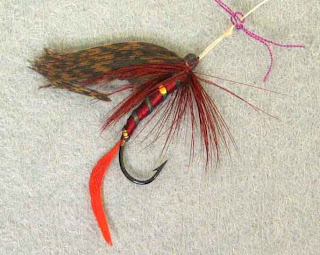 Fly-fishing enthusiast Tom Coe will demonstrate the art fly tying at the Adirondack Museum from July 23 through July 27, 2009. The demonstration will be held in the Mark W. Potter Education Center from 10:00 a.m. until 4:00 p.m. and is included in the price of general admission. Coe will tie flies and display hand-tied flies including saltwater patterns and those suitable for bass, trout, and panfish. Visitors will discover the specialized tools and varied materials needed to tie flies as well. Coe will also offer environmental displays of fish habitats. Games, activities, and a hands-on tying station will help youngsters learn more about fish and create a fishing fly of their own. 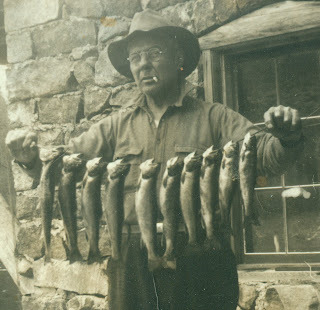 the AuSable River many years ago for an article about the Adirondacks by Dr. Anne LaBastile. Olympian Anders Johnson made the two longest jumps of the day to claim the annual 90-meter Summer Ski Jump at the Olympic Jumping Complex on Friday. Johnson, hailing from Park City, Utah, conquered the wet and rainy conditions without a hitch. He laid down a first round jump of 98.5 meters, and followed that with a 100.5-meter jump in the second round to earn a total of 267 points. Second place went to Nick Fairall of Andover N.H., who made jumps of 93.5 meters and 94.5 meters for 243.5 points. Alex Haupt, also from Park City, claimed the bronze medal with jumps of 88.5 meters and 87 meters for 212.5 points. The Art Devlin, Sr. Memorial Cup is awarded to the jumper with the most combined points from three events: the Summer Ski Jump, the Flaming Leaves Ski Jump, and the New Year’s Masters Ski Jump. The winner of the Art Devlin, Sr. Memorial Cup receives a cash prize of $1,000. In the junior division, lone female jumper Tara Geraghty-Moats of Fairlee, Vt., took the gold medal. The NYSEF jumper made jumps of 93.5 meters and 86 meters, earning 222.5 total points. Silver went to last year’s summer ski jump champion A.J. Brown, jumping 93 meters and 83.5 meters for 207 points. Zack Daniels and Brian Wallace each earned 197 points. Daniels landed jumps of 86 and 83 meters, while Wallace made jumps of 85 and 83.5 meters. While no DEC fishing license is required during free fishing weekend, other fishing rules and regulations remain in effect. To learn more about New York’s regulations and information on how and where to get a fishing license, visit this DEC website. 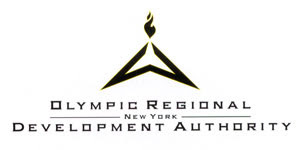 The United States Olympic Committee’s Lake Placid Olympic Training Center, and the Olympic Regional Development Authority (ORDA), are cosponsoring Olympic Day on June 20 from 1 p.m. – 3 p.m. at the Olympic Jumping Complex. Olympic Day is an international event celebrating and promoting the participation in sport by men, women and children from around the world. It is a worldwide commemoration of Baron Pierre de Coubertin’s June 23, 1894, convening of the first International Olympic Committee (IOC) meeting at the Sorbonne in Paris, and the founding of the Modern Olympic Games. National Olympic Committees (NOCs) throughout the world will also participate in the international celebration, with each Olympic Committee sending Olympic Day greetings to participating nations and to further the Olympic spirit and movement. Local sports club and organizations will be on hand to promote their sports with informational displays, exhibits and interactive activities. The U.S. Bobsled and Skeleton Federation, the U.S. Luge Association, NYSEF Ski Jumping, Lake Placid Figure Skating, Lake Placid Speed Skating, U.S. Biathlon, and the Lake Placid Horse Show Association are among the groups that are participating in Olympic Day. This free event features fun for the whole family. The first 1,000 people to enter the venue will receive a commemorative 2016 Chicago Olympic Bid bracelet that also provides free entry to the 1932 and 1980 Lake Placid Winter Olympic Museum from 3 p.m. – 5 p.m. as well as free admission to the Citizens Bank Saturday Night Ice Show at 7:30 p.m. at the Olympic Center. The activities begin at 1 p.m. with wheeled luge, hockey shot, biathlon, volleyball, and more. Freestyle athletes will be launching off the kickers in hopes of perfecting their twists, turns and flips before splashing down in the 750,000-gallon pool. Nordic athletes take to the ski jumps to see who can fly off the 90-meter jump and land the longest jump of the day. 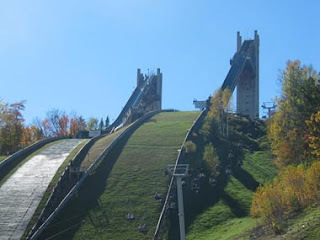 Visitors may take a chairlift and elevator ride to the Sky Deck high atop the 120-meter ski jump tower, listen to live music by 2006 Olympic biathlete Lowell Bailey, and get autographs from U.S. athletes. Athletes expected to be on hand include 2009 FIL World Luge Champion Erin Hamlin, three-time Olympians and 2009 FIL World Championship doubles bronze medalists Mark Grimmette and Brian Martin, 2009 FIS Freestyle Aerial World Champion and Olympian Ryan St. Onge, Olympic biathlete Tim Burke, and others, such as Olympic hopefuls John Napier (bobsled) and Haley Johnson (biathlon). Guests will also get a chance to win great raffle prizes, including tickets for the Lake Placid Bobsled Experience, VIP dinner at the I Love BBQ Festival, Olympic clothing and much more from famed Whiteface Prize Cube. The official ceremony is at 1:30 p.m. Village of Lake Placid mayor Craig Randall will read a proclamation supporting Chicago’s bid for the 2016 Olympic Summer Games, followed by a presentation of a ceremonial Chicago flag to Lake Placid. Olympic athletes from the area, as well as those currently in town training at the OTC, will also be recognized. The first trip, scheduled June 26 – 28 is for 9-11 year olds. 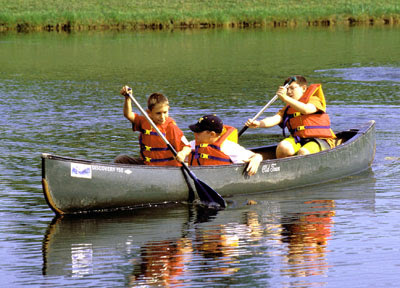 The group will be camping and canoeing in North River area of, New York. The cost for this trip is $20.00 per participant. There is required a pre-trip meeting planned for Thursday June 18th at the Warren County Fairgrounds. The second trip scheduled July 15–17 is for 12-15 year olds. The group will be canoeing and camping at Raquette Lake. The cost for this trip is $40.00 per participant. There is only one spot left on this trip, so call immediately if interested. 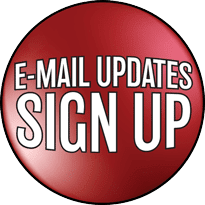 There is a required pre-trip meeting scheduled for Thursday July 9 at 6PM at the Warren County Fairgrounds. The 4-H Wilderness Trip Program is entering its 36th year of operation. 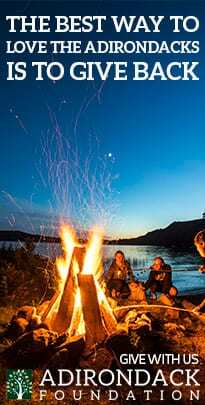 Activities on the trip will include woods lore and safety, identification of forest trees and wildlife, compass skills, canoeing skills and safety. Pre-registration and payment for these programs is required by June 18 and July 1 respectively. Please call Cornell University Cooperative Extension of Warren County at 518-623-3291 or 668-4881. On National Trails Day, June 6, at an event in Wanakena, St. Lawrence County, the New York State Department of Environmental Conservation (DEC) presented its Adirondack Stewardship Award to Paul DeLucia of Baldwinsville, Onondaga County, and his organization, known as Lean2Rescue, for their work in restoring Adirondack lean-tos. Since 2004, Lean2Rescue has worked on more than 30 lean-tos in St. Lawrence, Herkimer and Hamilton Counties, primarily along the western edge of the Adirondacks. 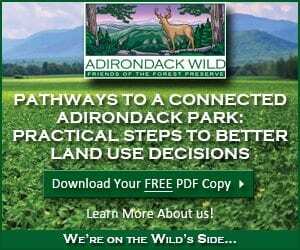 The Adirondack Stewardship Award is presented by DEC to groups or individuals who demonstrate outstanding stewardship of the natural resources of the Adirondacks. DEC Region 6 staff from the Divisions of Land and Forests, Operations, and Forest Rangers, along with the volunteers of Lean2Rescue, have rebuilt and renovated a total of 33 different lean-tos in wilderness and wild forest areas within the past four years. Lean2Rescue, with a core group of 20 to 25 members and additional assistance of up to 50 more volunteers, carried in logs, beams, boards, cement, shingles and more by hand, cart, and canoe to reach remote wilderness areas. Facing mud, rain, cold, and bugs, rescuers not only complete their mission of rebuilding a leanto, but then turn around and carry out old materials and debris. 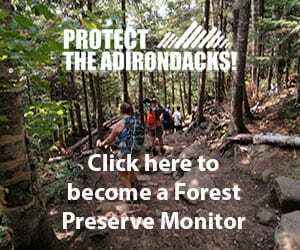 Previous Adirondack Stewardship Award recipients include Chad Dawson of SUNY Environmental Science and Forestry; Joe Martens of the Open Space Institute; Dave Gillespie of the Alpine Club of Canada and the New York State Ranger School; the Family of John E. Foley of St. Lawrence County and John Dent of St. Lawrence County; Friends of Mt. Arab and Mike Carr of the Adirondack Nature Conservancy and Adirondack Land Trust; Sierra Club’s Northeast Outings Committee and St. Lawrence County YCC; Paul Smiths College; the Adirondack Trail Improvement Society; Ward Lumber Company of Essex County; Edwin Ketchledge of Clinton County and the Chris Behr family of Vermont; Clarence Petty of St. Lawrence County and the Warren County Board of Supervisors; the Bouquet River Association of Essex County; and the Fulton Chain of Lakes Association of Herkimer and Hamilton Counties. The New York State Department of Environmental Conservation (DEC) has officially opened the Flume Trail System as the first trail system on forest preserve lands in the Adirondacks designed to allow mountain biking. Representatives and staff from DEC, the Town of Wilmington, the Wilmington Mountain Peddlers, Adirondack Mountain Club (ADK) and Whiteface Mountain Ski Area and the members of the public attended a ribbon cutting ceremony at the trailhead in the Wilmington Wild Forest. Earlier that morning volunteers spent time working on the trails. Afterward the Town of Wilmington and the Wilmington Mountain Peddlers hosted a barbecue. The Flume Trail System includes approximately eight miles of trails for four season recreational activities including mountain biking, hiking, cross country skiing, and snowshoeing. The trails were designed to meet the specifications of the International Mountain Bicycling Association and include trails rated as easy, moderate and hard. The system includes a trail along the West Branch of the Ausable River and a hiking only trail to Flume Knob. The majority of the trails lie within the Wilmington Wild Forest unit of the forest preserve, however, approximately two miles of trail are located on the Whiteface Mountain Ski Area, which is operated by the Olympic Regional Development Authority. The Town of Wilmington strongly advocated for mountain bike trails during DEC’s development of the management plan for the Wilmington Wild Forest. In addition to the Flume Trail System, the management plan, which was approved in October 2005, also proposes a seven mile multi-use trail system in the Beaver Brook Tract, off of Hardy Road, designed to include mountain biking. The Town also appropriated funds to pay for the Adirondack Mountain Club’s professional trail crew to construct new trail segments at the Flume in 2007. The Wilmington Mountain Peddlers have been involved from the early days of trail development at the Flume, and have also been strong advocates for mountain bike trails. The group has volunteered countless hours to construct and maintain the trails. They will continue to maintain the Flume Trail System under DEC’s Adopt-A- Natural-Resource program. In addition to work by their professional crew, the Adirondack Mountain Club has organized numerous volunteer work projects to upgrade existing trails and construct new trail segments at the Flume. 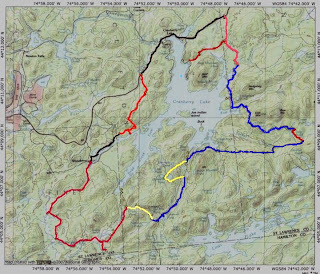 An ADK volunteer trail crew will be constructing a new trail to connect the Flume Trail System with the Whiteface Trail from the Wilmington reservoir this summer. The Whiteface Mountain Ski Area has allowed some of their trails to be included in the Flume Trail network for the free use of the public. These include a scenic trail along the West Branch of the Ausable River, utilized by bikers, hikers, and anglers. Mountain bikers can pay a fee to access the ski areas other 25 trails and the gondola to the top of Little Whiteface. Crews from Whiteface also assisted in the construction of some of the initial trails in the trail system. A proposed hiking only trail to Bear Den Cliffs, will be constructed in the future on the Whiteface Mountain Ski Area lands, and will be open to the public as part of the Flume Trail system. The Flume Trail System can be accessed from trailhead on Route 86, approximately 2 miles west of the hamlet of Wilmington or from the Kid’s Campus parking lot at the Whiteface Mountain Ski Area. 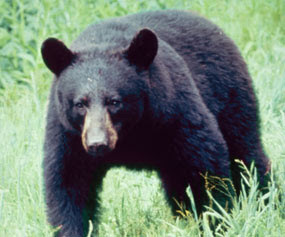 The New York State Department of Environmental Conservation (DEC) is reminding campers, hikers and homeowners to take precautions against unwanted encounters with black bears. 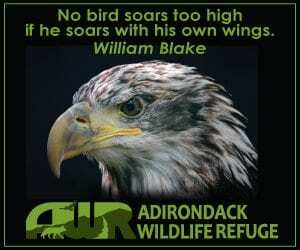 There are approximately 4,000 – 5,000 bears in New York’s northern bear range, primarily in the Adirondacks. Bear populations have been increasing in number and expanding in distribution over the past decade. Black bears will become a nuisance and can cause significant damage if they believe they can obtain an easy meal from bird feeders, garbage cans, dumpsters, barbecue grills, tents, vehicles, out-buildings or houses. When bears learn to obtain food from human sources, their natural foraging habits and behavior are changed. » Continue Reading. 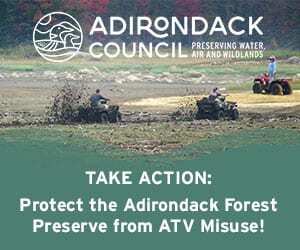 June 6th is National Trails Day and Adirondack region hikers will have an opportunity to volunteer, at Cranberry Lake in the western Adirondacks. 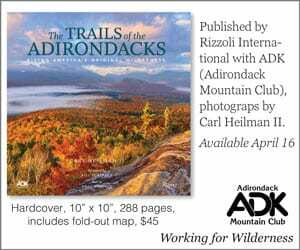 Each year, the Adirondack Mountain Club (ADK) sponsors an event in conjunction with the American Hiking Society’s celebration of National Trails Day. This year, ADK’s event will celebrate the Cranberry Lake 50, the recently completed 50-mile loop around the lake. 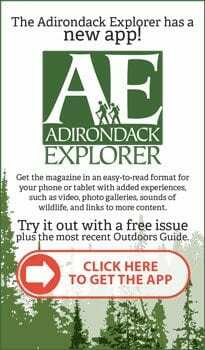 According to the ADK: “Volunteers will spend the day performing trail-maintenance work, such as cutting brush, removing blowdown and building waterbars and rock steps, under the supervision of an ADK trail professional. 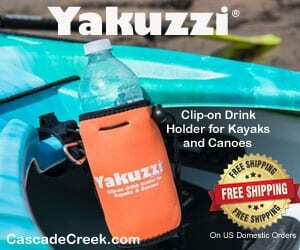 One crew will tour the lake by motorboat, with state Department of Environmental Conservation personnel, to move outhouses and clean up campsites. There will also be a project for kids, planting tree saplings near the Streeter Lake lean-to.” » Continue Reading. The Whiteface Mountain Veterans Memorial Highway in Wilmington kicked-off the openings on Friday (May 15). The highway allows visitors to drive to the top of the fifth-highest peak in the Adirondacks. The highway is an eight-mile drive from Wilmington to the summit, where a castle made of native stone and an in-mountain elevator await. The highway will be open daily from 9 am – 4 pm thru October 12. The Olympic Sports Complex, where the combined bobsled/luge/skeleton track and the 1980 Olympic Bobsled Track are located, began summertime venue tours Saturday (May 16). Tours will be available daily thru October 12 from 9 am – 4 pm. The Lake Placid Bobsled Experience consists of a ½-mile wheeled bobsled ride with a professional driver and brakeman through awe-inspiring turns, a 4”x6” photo, commemorative pin, a team gift and more. The LPBE is scheduled to begin May 30 for weekends only from 10 am – 4 pm through June 21. Starting June 27, bobsled rides will be available Thursday through Monday until September 6. Mountain biking on the cross country ski trails at the Olympic Sports Complex begins May 23 with the trails open on weekends only thru June 21, with daily operation beginning June 27. The venue offers over 20 miles of trails for riders from beginner to intermediate. High Peaks Cyclery runs the mountain bike center at the venue and offers lessons, rentals, and trail passes. The trails will be open from 10 am – 5 pm, and rentals are available. The “Be a Biathlete” clinics begin June 27 at the Olympic Sports Complex Biathlon Range. Participants learn the basics of the sports of biathlon, are taught gun safety, and then get to shoot a .22 caliber rifle at the same targets used during the 1998 Olympic Winter Games in Nagano. This program is offered Thursday through Monday from 10 am – 4 pm. The Olympic Jumping Complex, home to the 90-meter and 120-meter ski jump towers and the freestyle aerial training facility, is currently open 9 am – 4 pm Thursday-Sunday. 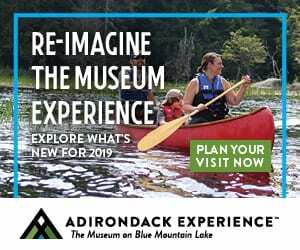 The complex offers a 26-story elevator ride to the Sky Deck atop the 120-meter tower for spectacular views of the Adirondacks, and on May 23 opens the chairlift from the base lodge to the base of the ski jump towers as well. The chairlift and elevator are open Friday-Sunday until June 26, when both the chairlift and elevator will be open daily. The Olympic Jumping Complex is also home to the Soaring Saturdays and Wet and Wild Wednesdays jumping series. Each Saturday, beginning July 4 and running thru August 22, top Eastern ski jumpers take to the hill in hopes of landing the longest jumps of the day. The season ends with the Flaming Leaves Festival October 10-11. At the freestyle aerial center, aerialists of all types launch from one of three kickers high into the air, performing twists, flips and turns before splashing down in the 750,000-gallon pool. The pool opens for the summer training season in June. The center is home to the weekly Wet and Wild Wednesday aerials shows, beginning July 8 and running through August 26. Another highlight at the pool is the annual Huck & Tuck Summer Freestyle Competition, slated for August 29. The Whiteface Ski Center will open for the summer season on June 19. The mountain offers scenic Cloudsplitter gondola rides which take guests to the summit of Little Whiteface, lift-serviced downhill mountain bike trails for pedalers of all abilities. For further mountain biking information go to www.downhillmike.com. Whiteface also offers an hour and a half nature trek to the beautiful Stag Brook Falls. Gondola rides and mountain biking are available daily from 10 am – 4:30 pm thru September 7. Nature treks depart the base lodge each day at 11 am from June 26 to September 17. The Olympic Center is celebrating the 77th Anniversary of the Summer Skating Program. In addition to being named “The Best Summer Skating Camp for Kids” by Sports Illustrated For Kids magazine, the Olympic Center also offers basic skills lessons, hockey power skating classes, and hosts the weekly Citizens Bank Skating Series, including Freaky Friday and Saturday Night Ice Shows. 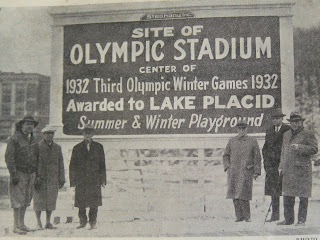 This year the Olympic Center is host to the annual Lake Placid Free Skating Championships and the Ice Dance Championships, as well as the USA Hockey Junior Men’s Camp. For more information on ORDA venues and events and for web cams from five locations visit www.whitefacelakeplacid.com.